The Book of Martyrs. Containing an Account of the Sufferings and Death of the Protestants in the Reign of Queen Mary the First. Illustrated with Copper-Plates. Originally written by Mr. John Fox. Now carefully Revised and Corrected with a Recommendatory Preface by the Rev. Mr. Madan. London: For H. Trapp, 1776. Folio; pp. 815, (4). 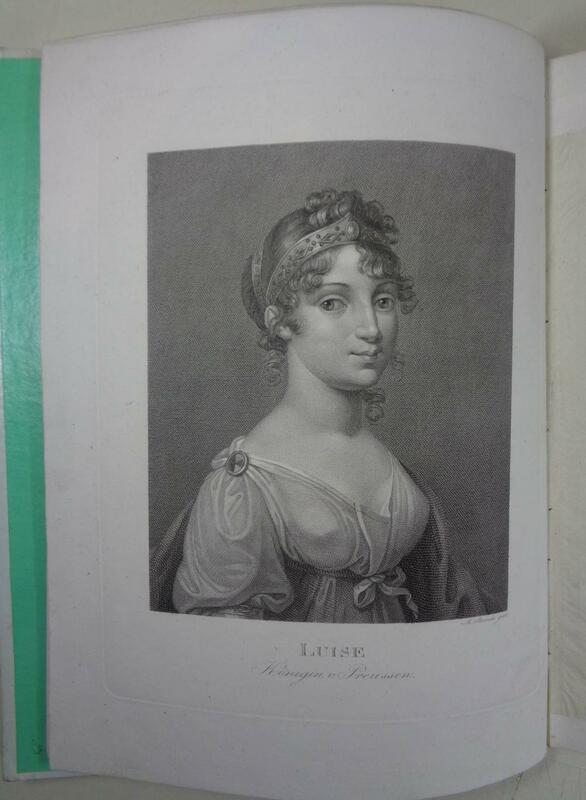 Complete with 30 copper engraved plates and a copper engraved title page. 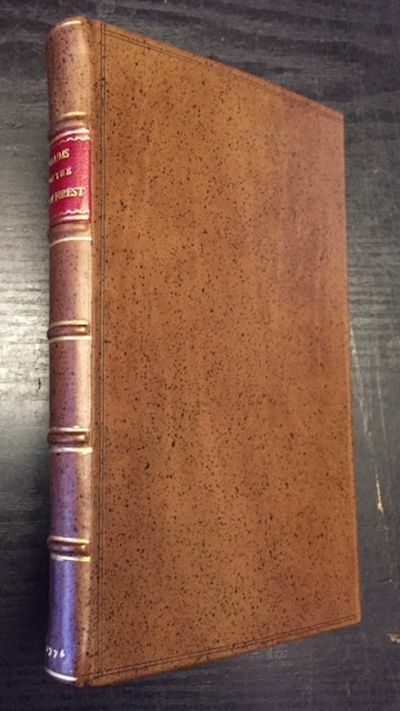 Recently bound to period style in full speckled calf with blind tooled raised bands and red title label to spine, panelled boards. Occasional browning, light occasional foxing, offsetting of plates on to text. A very attractive copy. Untitled: Pine Tree with Squirrel. Paris. 1776. Etching, handcolored, 11 x 7 3/4 inches on sheet 17 x 11 inches. Very good condition. A beautiful image from Pierre Joseph Buchoz "COLLECTION PRECIEUSE ET ENLUMINEE des fleurs les plus belles et les pulus curieuses, qui se cultivent tant dans les jardins de la Chine que dans ceux de l'Europe". Designed to be "equally useful for naturalists, florists, painters and drawers, to directors of Porcelaine, Fayence, and silk, wool and cotton fabrics and other artists." The 100 etching / engravings of Chinese subjects were copied from Chinese drawings, and were instrumental in popularising the use of Chinese design. (Dunthorne, Flower and Fruit Prints #60). Considérations filosofiques sur la franc-maçonnerie Dédié à tous les Oriens en France, par un Député de Jérusalem. An Inquiry into the Nature and Causes of the Wealth of Nations. In two Volumes. London, 1776. ,136pp. Dbd., with remnants of original spine present. Some light soiling and foxing. Good. In a blue half morocco and cloth folder. 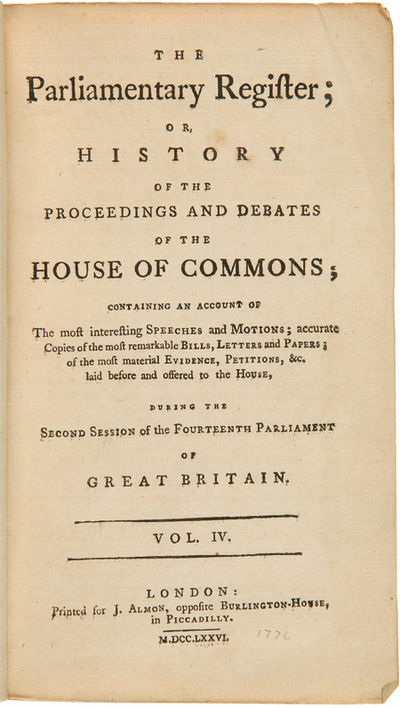 Volume IV of Almon's PARLIAMENTARY REGISTER, published by him from 1775 to 1780. This volume contains important political information regarding the American Revolution, including a motion to put America on the same political footing as Ireland, as a means to restore peace there. It also includes some discussion of General Howe's being given the authority to treat for peace with the colonies. 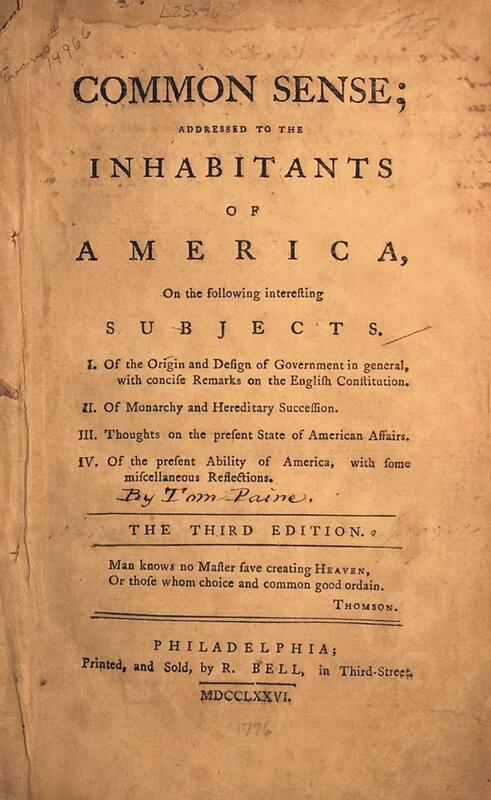 Most of the debates revolve around the American question, and the volume closes with the King's Address of May 23, 1776, in which he states: "We are engaged in a great national cause...I am convinced you will not think any price too high...." The volumes - numbering seventeen in all - were edited and published by John Almon, the pre-eminent British printer of political material of his day, and he received assistance from the members of the Commons, who supplied him with copies of their speeches (some of which were no doubt altered for posterity). It should be remembered that there was no regular authorized system of reporting Parliamentary debates at this time or for many decades to come, and that the collection and organizing of this publication was undertaken entirely by Almon. An important source for the American Revolution. York: printed by A. Ward for J. Dodsley, Pall Mall; T. Cadell, in the Strand; J. Robson, New Bond St. And T. Durham, Charing Cross , London. W. Creech and J. Balfour, Edinburgh, 1776. Full-Leather. Large Quarto. Original subscribers copy with a later family member's small name plate and name neatly written and dated 1861 on the first blank. Engraved frontispiece of John Evelyn, (3)pp. editor's preface, (8)pp. subscriber's list, which includes such names as Francis Bacon, James Boswell, (J)ames Cook, Edward Gibbons; etc. (13)pp. The Life of Mr. John Evelyn, (3)pp. dedication to the king, Charles II, (17)pp. "to the reader", (2)pp. advertisement, (1)pp. Greek poem by Evelyn, (1)-649pp., (1) large folding explanatory table, (9)pp. index, containing forty (40) plates (one folding) as called for by (Henrey, 137), plate from p. 119 mis-placed to facing p. 89, bound in contemporary brown diced calf, professionally rebacked retaining the old spine (laid down) and original marbled endpapers, board edges with single rules in gilt, inner gilt dentelles, all edges gilt; gilt lettering to spine gone, occasional light off-setting of some plates. An outstanding copy of one of the most important books written on forestry, newly updated to provide the latest discoveries by Andrew Hunter, who felt anyone with land should plant or at least nurture the trees they already had, rather than wait until they are too old to plant a new tree to replace that tree which soon will die along with the owner. Hunter states that anyone can plant a tree but will they know species they are planting? Will they know how to nurture that newly planted tree? 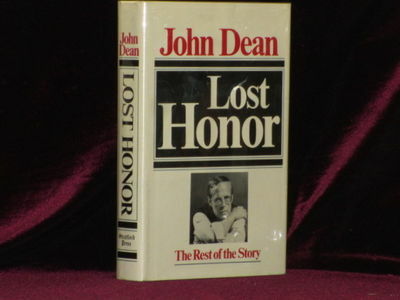 This edition is regarded by most, the best edition. A lovely, wide margined copy, internally clean. MANETTI, Saverio, Lorenzo LORENZI & Violante VANNI]. 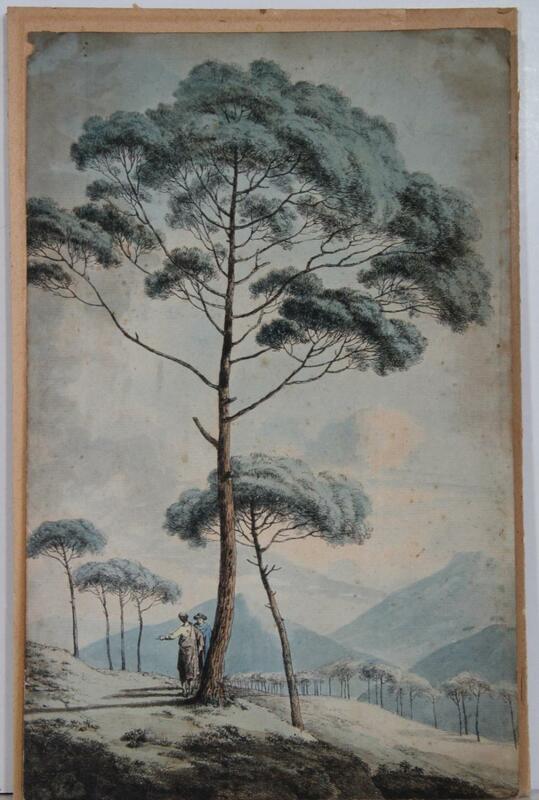 Giuseppe Vanni Florence 1776 - Hand-coloured etching, with engraving. Original colour. Very good condition with strong, fresh colour and full margins. Framed and glazed, overall dimensions: 41.5cm by 49.5cm. Storia naturale degli uccelli. 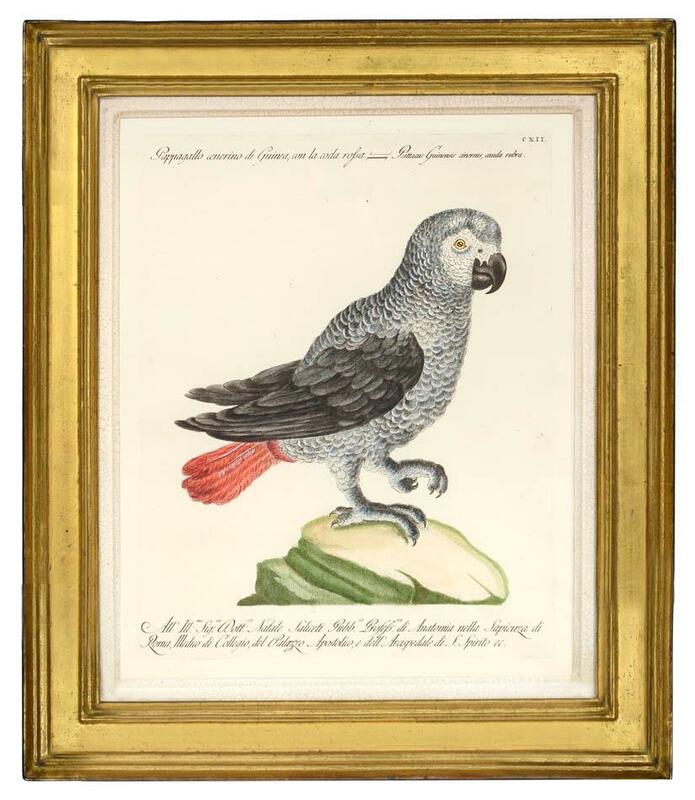 was one of the finest bird books issued to that date and one of the most sumptuous publications of the eighteenth century in Italy" (Christine Jackson, Dictionary of Bird Artists of the World). Fine Bird Books (1990), p.92; Nissen "Zoologische Buchillustration", IVB 588; Zimmer, p.241. Ostervald, Rev. Mr. Jean F.
Colin MacFarquhar (printer, Old testatment) William Darling, Printer, ( New Testament), Edinburgh 1776 - Folio. No pagination, bound in contemporary blind stamped calf with early joint repairs; all edges and endpapers marbled, front blank repaired near gutter; some internal soiling, older paper repair to lower corners of the first and last several leaves; 3 leaves with lower fore-corners chipped, one affecting a few words, and one a side note. An early edition, not in Darlow and Moule and quite scarce. An interesting two page manuscript laid in, neatly written and titled "A Novel Calculation" citing the author, notes, calculations of the number of books, chapters, verses, words, letters, etc. in both the new and old testament, dated 8th December 1864. An Abstract of All the Claims on the New Forest, in the County of Southampton, Entered at the Lord Chief Justice in Eyre's Court, Adjourned from the Swainmote Court, Held at Lyndhurst, the 27th of June, in the 22nd Year of King Charles the Second and Held at Winton, the 29th Day of September, 1670. Salisbury: Benj. Cha. Collins and J. Johnson 1776. 202, (10) pp. Modern full sprinkled calf. Five raised bands to spine. Red morocco title label. New endpapers. Uncommon. Clean internally with binding in Fine condition. 21 cm. tall . Near Fine. Full Calf. 1776. 8vo..
Mappe-Monde ou Description du Globe Terrestre. 1776 - Paris: 1762. Coloured, 310 x 460mm. 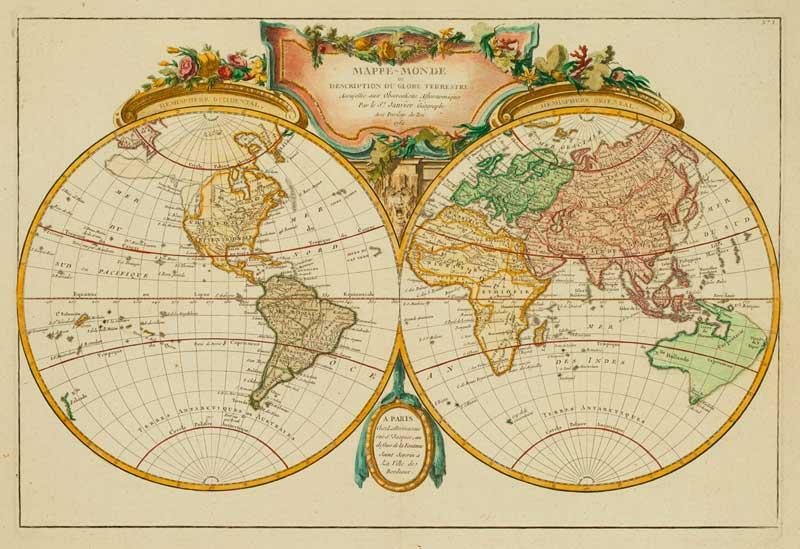 A decorative map of the World, with a large rococo title cartouche. The map is pre-cook. Includes the Muller Peninsula in Alaska, an enlarged Australia, and the Sea of the West in North America. Hardcover.. Publisher: Arvidi Collin | 1776 | Hardcover. | 63 p. | | Some wear, typical antiquarian condition. --- Information regarding the book: FÃ¶rteckning Ã¶ver StrÃ¤ngnÃ¤s domkyrkas bibliotek, frÃ¥n Ã¥r 1776, dÃ¥ biblioteket funnits till i 153 Ã¥r. Mycket ovanlig. Italienische Landschaft mit 2 Figuren unter großen Bäumen in hügeliger Umgebung. Kreidezeichnung und Aquarell. Monogrammsignatur unten links "H.R. 76". Np [Connecticut], 1776. Accomplished in manuscript, signed by Samuel Peck and Aaron Bull with their paper-covered seals, and countersigned by T. Seymour and Edward Seymour, docketed on verso. Folio (14 x 8-1/2 inches). Creased from prior folding. Accomplished in manuscript, signed by Samuel Peck and Aaron Bull with their paper-covered seals, and countersigned by T. Seymour and Edward Seymour, docketed on verso. Folio (14 x 8-1/2 inches). 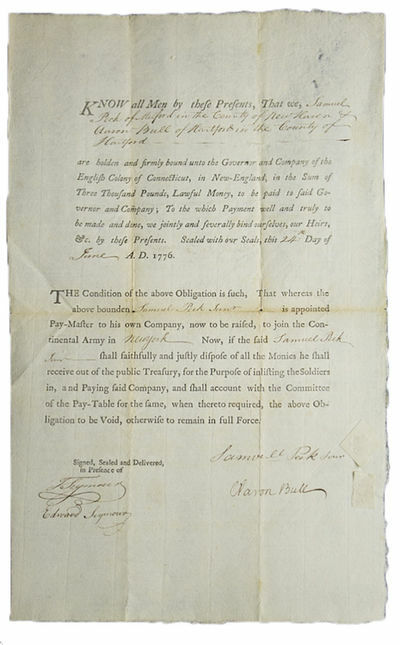 Samuel Peck of Milford is appointed paymaster to his Company of the Continenal Army. He and Arron Bull of Hartford are beholden to the Governor and Company of the English Colony of Connecticut for 3,000 pounds in the event that Peck does not "faithfully and justly dispose of all the Monies he shall receive out of the public Treasury." Peck (1716-1801) was in the Fifth Battalion, Wadsworth's Brigade, under Col. William Douglas, raised to reinforce Washington's army in New York. Apéndice a la educación popular. Parte cuarta que contiene los ocho discursos de Francisco Martínez de Mata, con uno de nuevo sobre el comercio nacional, en que presentan las observaciones, que parecen adaptables al estado presente. 1776. Madrid, 1776. Imprenta de D. Antonio de Sancha. 306 pp. 16x11 cm. Pasta española. Cortes decorados. Roces en cubiertas. Lomera deslucida. Sellos. Información y fotos en nuestro blog. 1776. CHEZ MARS-MICHEL. 1776. In-8.Carré. Broché. Etat d'usage. Couv. convenable. Dos satisfaisant. Intérieur frais. 256 pages. Témoins conservés. Couverture muette. Praxis Geometriae, worinnen nicht nur alle bey dem Feld-Messen vorkommende Fälle, mit Stäben, dem Astrolabio, der Boussole, und der Mensul . deutlich erörtert . 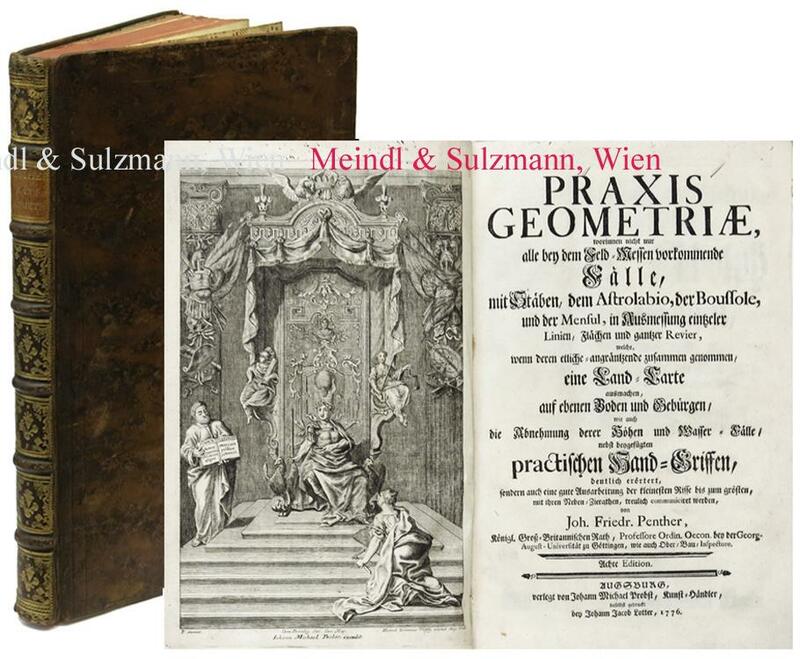 Achte Edition / Zugabe zur Praxi Geometriae, worinn noch verschiedene zur ausübenden Geometria nützliche Stücke, dabey auch zweyerley Arten Architectonische Schnecken . und endlich eine Zusammensetzung einer guten Wasser-Waage, wie auch derselben Gebrauch mitgetheilet wird. 2 Teile in 1 Band. Imprimerie de la La Société Typographique, 1776. Faites ou approuvées par Messieurs de L'Academie Royale des Sciences de Paris: avec figures en taille-douce. Nouvelle Edition. Publiée avec observations, & augmentée de tout ce qui a été ecrit de mieux fur ces matieres, en Allemagne, en Angleterre, en Suisse, en Italie. Tome IV contenant: l'art du Tuilier et du Briquetier, l'art de tirer des carrières l'Ardoise, l'art du Couvreu, l'art du Chaufournier , l'art de faire le Papier, l'art du Cartonnier, l'art du Cartier. Con numerose incisioni su tavole f.t. 8vo. pp. 658 + tavole. Molto Buono (Very Good). Abrasioni e fori di tarlo alla copertina. 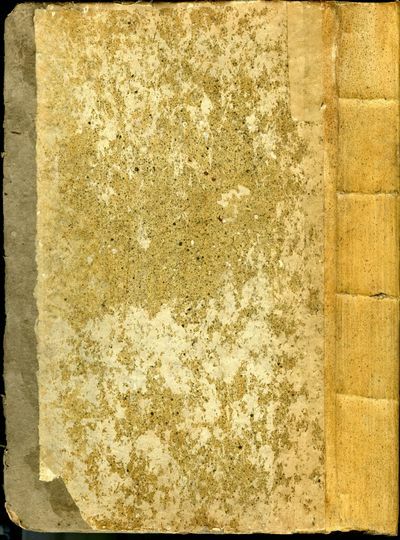 Pagine interne e tavole in ottimo stato (Abrasions and little holes at covers). .
Abvlfedae Descriptio Aegypti, Arabice Et Latine. Ex Codice Parisiensi Edidit, Latine Vertit, Notas Adiecit, Ioannes David Michaelis, Stellae Polaris Eqves, Regis M. Britanniae Consiliarivs Avlicvs, Et Professor Philosophiae Goettingensis. BOURBON ( LOUISE MARIE ADELAÏDE de ). Paris, 1753 - Château d'Ivry sur Seine, 1821. 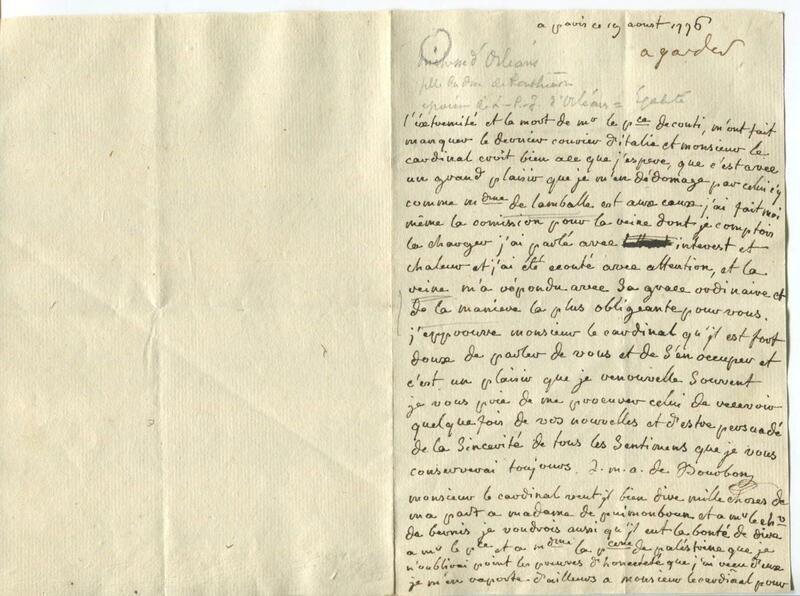 Elle intercède en faveur du Cardinal [de Rohan ] auprès de MARIE ANTOINETTE, et demande à celui-ci de dire "mille choses à Madame de PUIMONBRUN et au Chevalier de BERNIS, et de parler en sa faveur auprès du Prince et de la Princesse de Palestrina". - Chez Vincent, A Paris 1776, pet. in 8 (11x17cm), xij, 771pp. et (2) 795pp., 2 volumes reliés. - Edizione originale. Leganti pieno screziato periodo di pelle di pecora marrone. Indietro con i nervi decorati. come mostre in pelle rossa e montone nero numero del volume di pezzi. Carenza capi di 2 volumi. La mancanza del terzo nervo Volume I. Un angolo smussato. Indietro, numero del volume di pezzi, punte e bordi, angoli strofinato. Buona copia. Eccellente dizionario elenca gli artisti e artigiani di tutti i tempi e le loro opere, una delle prime nel genere. Le istruzioni sono forniti e chiaro, diverse pagine alle più grandi artisti; si troverà ulteriori orologiai e musicisti, cantanti e attori. - [FRENCH VERSION FOLLOWS] Edition originale. Reliures en pleine basane brune marbrée d'époque. Dos à nerfs ornés. Pièces de titre en maroquin rouge, et pièces de tomaison de basane noire. Manques en têtes des 2 tomes. Manque sur le troisième nerf du tome I. Un coin émoussé. Dos, pièces de tomaison, mors et bordures, coins frottés. Assez bon exemplaire. Excellent dictionnaire recensant les artistes et artisans de tous les temps ainsi que leurs oeuvres, un des premiers dans le genre. Les notices sont fournies et claires, de plusieurs pages pour les plus grands artistes ; on y trouvera en outre les horlogers et les musiciens, les chanteurs et les acteurs. NB : Cet ouvrage est disponible à la librairie sur demande sous 48 heures. Versuch über die musikalische Temperatur, nebst einem Anhang über den Rameau- und Kirnbergerschen Grundbaß und vier Tabellen. Brillenlose Reflexionen über das jetzige Heilwesen, nebst Beleuchtung der dem Kaiser Franz, dem Erzherzog Victor Anton und dem Prinzen August von Portugall zu Theil gewordenen Behandlung. VIII, 92 S. HLwd. d. Zt. Hirscgh-H. III, 619 Tischner, Geschichte der Homöopathie 167. - Krüger-Hansen (1776-1850) kämpfte hauptsächlich gegen den von ihm verhassten Aderlass und wandte sich so der Homöopathie zu. - Gering berieben. Titel verso mit verblasstem Stempel. Tls. wenig braunfleckig. London: J. Dodsley,, 1776. Formerly printed separately: and now first collected together, with some other pieces never before printed. Published by George Edward Ayscough, Esq., The third edition: to which is added a general index. 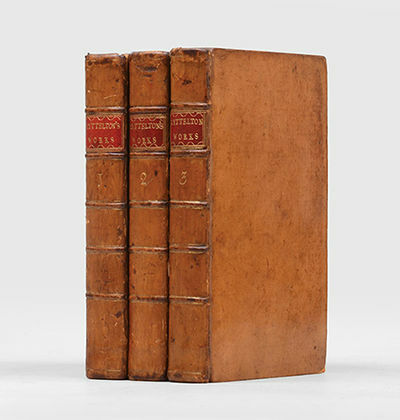 3 volumes, octavo (205 Ã— 125 mm). Contemporary speckled calf, red morocco labels, spines gilt ruled either side of raised bands, yellow edges. Portrait frontispiece by Josiah Collyer after Benjamin West. 20th century bookplate of Robert J. Hayhurst, an avid collector of naval history and eighteenth-century literature in contemporary bindings, of which this is an excellent example. Bindings a little rubbed , scattered foxing but a very good set. An attractive set in unassuming contemporary calf, with an engrossing provenance: from the library of the Scottish slave-trader, merchant and diplomat Richard Oswald (1705?-1784), with the simple booklabels of Auchincruive House (his Adam-designed mansion in south Ayrshire) and ownership inscriptions (first page of the opening chapter in each volume) of his grand nephew, Richard Alexander Oswald (1771-1841), Liberal MP for Ayrshire and author of pamphlets opposing the Corn Laws. Richard Oswald was a major figure in the slave-trade of Georgian Britain and the distinguished historian Adam Hochschild gives a compelling summary of his significance: "Oswald had learned the import-export business in several corners of the empire: Glasgow, Virginia, and Jamaica. In 1746, he settled in London, where, from a modest brick home and office at 17 Philpot Lane, he rapidly built up an international trade in slaves and in a wide range of goods, from horses to wigs. He sold tar and turpentine to the Royal Navy, and wagons, hay, and more than five million loaves of bread to the army. Before long he came to own shares in ships and in slave plantations in South Carolina, Jamaica, and Florida. Oswald's ships could then carry slaves from his depot-fortress at Bance Island [Sierra Leone] to his plantations in the Americas, and return to England loaded with their sugar or tobacco. Although his business ranged as far as India, its core was the triangle trade. With lucrative investments in each corner of the triangle and in the ships that sailed among them, he amassed a fortune of some Â£500,000, roughly equal to $68 million today... His contemporaries saw him as a wise, thoughtful man who embodied the Scottish virtues of frugality, sobriety, and hard work, and who spent all his spare time reading, often far into the night. He supervised the construction of a home library with sliding glass panels that contained more than two thousand books of theology, philosophy, literature, and history... Among those who shared conversation at his London dinner table, or could hunt pheasants while visiting his 100,000 acre estate in Auchincruive, Scotland, were Benjamin Franklin and the writers Laurence Sterne and James Boswell. Oswald played a major role in Scottish road building, gave to charity, and... would represent his country on a crucial diplomatic mission [as an American Revolution treaty negotiator]. Although Bance Island was a cornerstone of his fortune, one way in which he was typical of the Britons who reaped the greatest profits from the Atlantic slave economy was that he never set foot in Africa" (Bury the Chains: Prophets and Rebels in the Fight to Free an Empire's Slaves, 2005, p. 27). 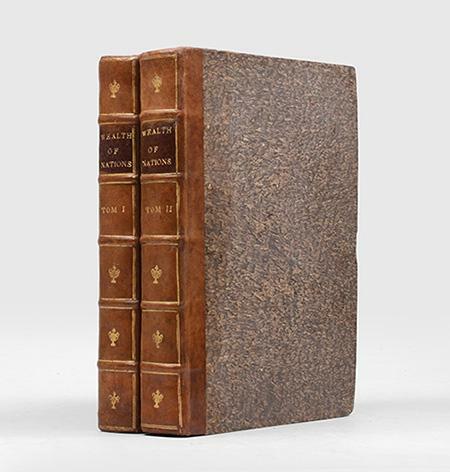 Third and best octavo edition (with the index), first published in 1774 and gathering various political pieces, Lyttelton's "Letters from a Persian in England to his friend in Ispahan", his very popular Dialogues of the Dead - co-written with the bluestocking Elizabeth Montagu - a smattering of poems and a collection of letters to his father Sir Thomas Lyttelton. 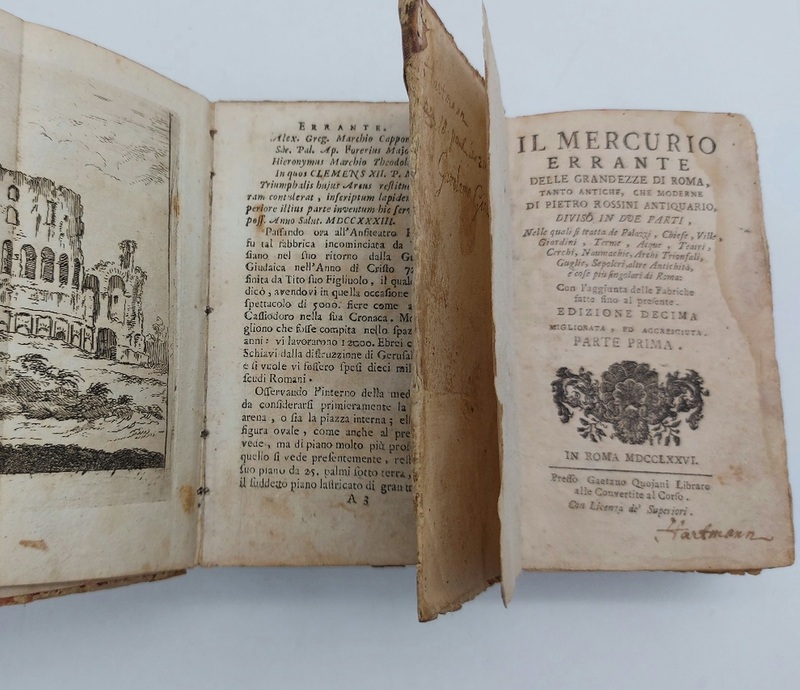 The Auchincruive library was broken up in 1922 (Sotheby's 1 May) and Seymour de Ricci notes that it included some "very fine eighteenth-century French books, in old morocco bindings" (English Collectors of Book & Manuscripts, 1930, p. 190), reflecting the exceptional quality of the library as a whole. 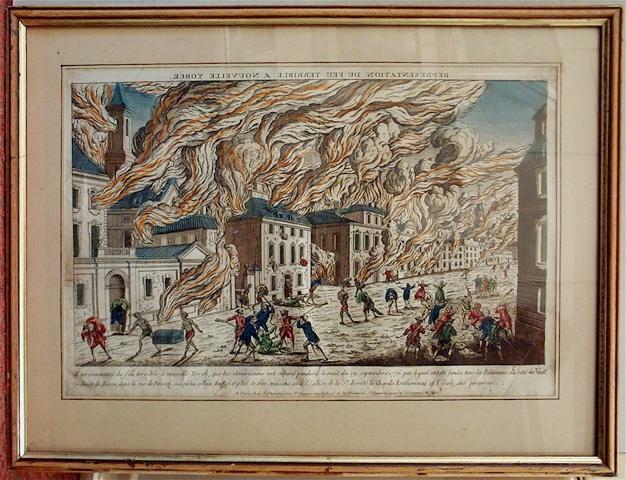 London: Printed by Richard Hett, for the Company of Stationers, 1776. Very good antiquarian condition. 8vo. (203 x 123 mm). 236,  pp. Collation: A-P8, COMPLETE. Contemporary Liverpool binding of full red morocco elaborately gilt; wide gilt border of urns and flowers surrounding a black inlay gilt with the name of the first owner: "William Pole Esqr. / Mayor 1778." Marbled pastedowns and endpapers, a.e.g. Trifle wear to binding extremities. Preserved in a dark brown cloth protective case. AN ELEGANT LIVERPOOL BINDING. While the workshop is still-unnamed, ten examples are known to us, including two bindings that were bound for two different Liverpool Lord Mayors. 1. Psalms (London, 1778) -- bound for Robert Landor, Church Warden of St. Paul's Church, Liverpool dated 1782 (Private Collection) 2. 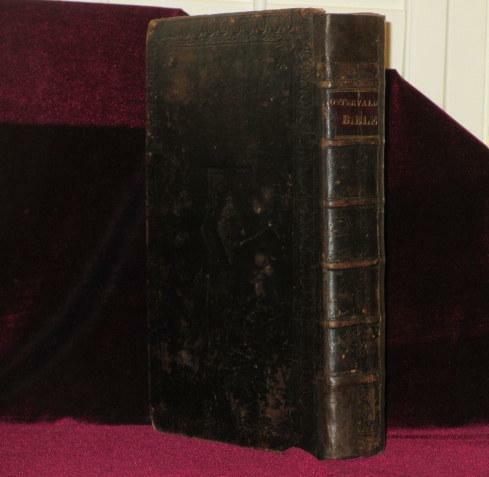 Bible (Oxford, 1772 -- two volumes) -- bound for presentation to Liverpool Mayor John Brown dated 1772 (Lathrop Harper Cat. 239 item 101 --> Christie's London 25 June 1997, lot 154) 3. Bible (Cambridge, 1768) -- Earls of Derby, Knowsley Hall Library (Lancashire, near Liverpool) --> Sale, Christie's London 1954 --> now Liverpool University Library (Knowsley 705) 4. Bible (Oxford, 1772 -- two volumes, as above) -- Pierpont Morgan Library and Museum (PML 12936) 5. Book of Common Prayer (Cambridge 1770) -- Maggs Cat. 966, item 154 6. 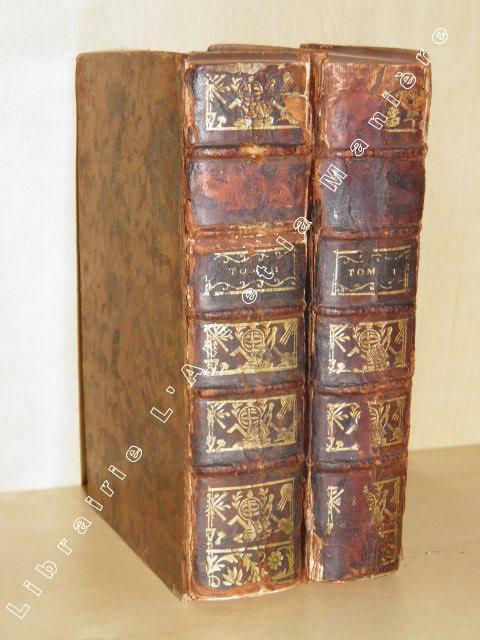 Book of Common Prayer (Oxford 1770) bound for presentation to George III -- Maggs Cat. 893, item 111 7. Bible (London, 1767) bound for "M*B" (i.e. Maria Barclay, presented to her in NYC by her son-in-law Col. Stephen Delancy) 8. 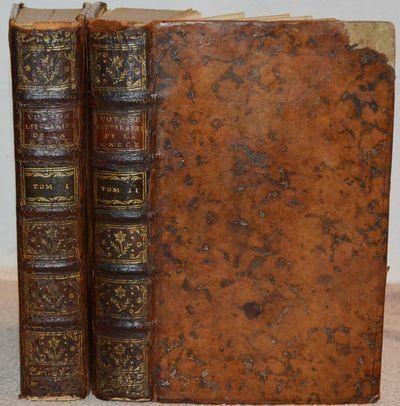 Book of Common Prayer (Oxford 1773) bound for Liverpool attorneys Richard Gerard and James Clemens "Gent. Bailiffs, 1773" (formerly Alice Welsh Skilling and Raymond Skilling Collection, Chicago, Illinois, sold Leslie Hindman auction, 6 Nov 2013, Lot 216) 9. John Morrison, The Advantages of an Alliance with the Great Mogul (London, 1774), British Library (280e18) 10. The present binding, executed in 1778 for William Pole, Esq. Mayor (of Liverpool from 1778-1779) dated 1778. Pole was Collector of Stamp Duties and Agent of the Sun Fire Office (a long biographical note appears in pencil on first blank leaf) -- subsequently in the library of noted Liverpool bibliophile and philanthropist Rev. S[amuel] A[shton] Thompson Yates (1843-1903), with his armorial bookplate. The names of early Liverpool bookbinders are few, but we have located two of them in Gore's 1766 "Liverpool Directory," namely Peter Wright (on Bixteth Street) and Richard Wright (on George Street). The work of the present binder was not within the scope of Ramsden's "Bookbinders of the United Kingdom (Outside London) 1780-1840. It would appear that the Wrights continued working in Liverpool for some time. According to Ramsden, the name Richard Wright appears in the 1777 and 1781 directories, and Peter Wright in the 1790 directory. In the 1793 records of burials at Our Lady and St Nicholas, Liverpool, a certain William Wright is listed as a bookbinder on Sweeting Street. This edition of the Psalms is scarce: ESTC (T206585) lists only 5 copies worldwide, none in America. Liege: J.F. Bassompierre, 1776. Hardcover. Near Fine Condition. Charles Coypel; Bernard Picart, et al. 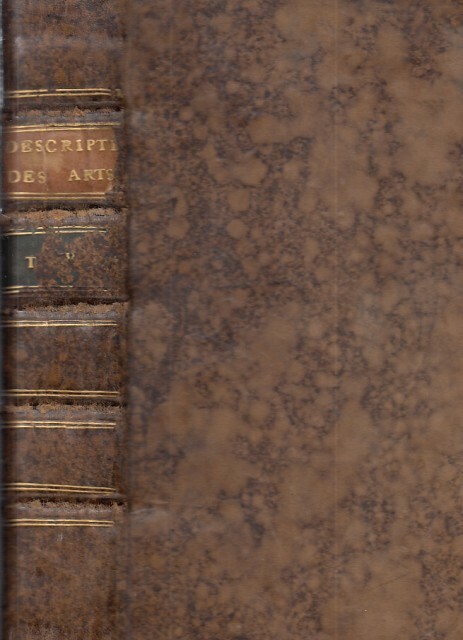 Original plain boards, worn at edges, neatly rebacked in period style, old signatures to title from the de Bellefoids, endpapers a little soiled. Light browning to deckle edges, scattered minor foxing and creasing, opened poorly in a few spots - a lovely unsophisticated copy with very wide margins. 31 engraved plates, fine historiated initials; 15 1/4 9 3/4 (folio size, but actually a very large quarto) In a custom brown cloth clamshell box. 356pp. Palau II 170, Brunet I 1752 Size: Quarto (4to). Illustrator: Charles Coypel; Bernard Picart, et al. Quantity Available: 1. Shipped Weight: 2-3 kilos. Category: Literature & Literary; Antiquarian & Rare. Inventory No: 046299. Lebensbeschreibung der hochseligen Königin Luise von Preussen. Erfurt, F. Stückel für Hennings in Gotha 1826. 4°. 2 Bll., 32 S., mit Kupferst.-Porträt, Goldschn., Pbd. d. Zt. mit Rsch. u. Deckelverg. - Nur wenige Exemplare über KVK nacheisbar.- Mit gestochenem Porträt der Königin Luise von Preußen (1776-1810) v. Moritz Steinla (1791-1858) nach dem Ölgemälde von Josef Maria Grassi aus dem Jahr 1802.- Nur gering braunfleckig, Ebd. etw. fleckig u. bestoßen.- Aus der Bibliothek von Prinz (Friedrich?) Karl von Preussen mit dessen gekröntem Besitzstempel am Titel ! Ramler, Karl Wilhelm, Dichter und Philosoph (1725-1798). Eigenh. Brief mit U. Berlin, 22. IV. 1776. 1776. 3 SS. 4to. An einen schriftstellernden Freiherrn: "Das Geschenk Ihrer Freundschaft, hochgeehrtester Herr Baron, und die Erstlinge Ihrer satirischen Muse nehme ich mit dem freundschaftlichsten Herzen an, und bedaure nichts mehr, als daß ich, bey Dero Anwesenheit in Berlin, nicht das Vergnügen Ihres Umgangs genossen habe. Ich bin Ihrem damahligen Begleiter, der mich oft besuchte, deswegen noch einen Verweis schuldig. Da Sie in Ihrem Gedichte so viel vortreffliche und meisterhafte Züge angebracht haben, so würde mir es sehr leid seyn, wenn die künftigen Geschäffte Ihres Lebens sie verhindern sollten, noch ferner um den Preis der Dichtkunst zu kämpfen. Ist dieses aber Ihr Schicksal, so weiß ich noch ein Mittel, wie Sie sich mit den Musen beschäfftigen können, ohne den Zusammenhang Ihrer künftigen Amtsgeschäffte merklich zu unterbrechen. Uebersetzen Sie uns alsdann einen Griechen oder Römer. 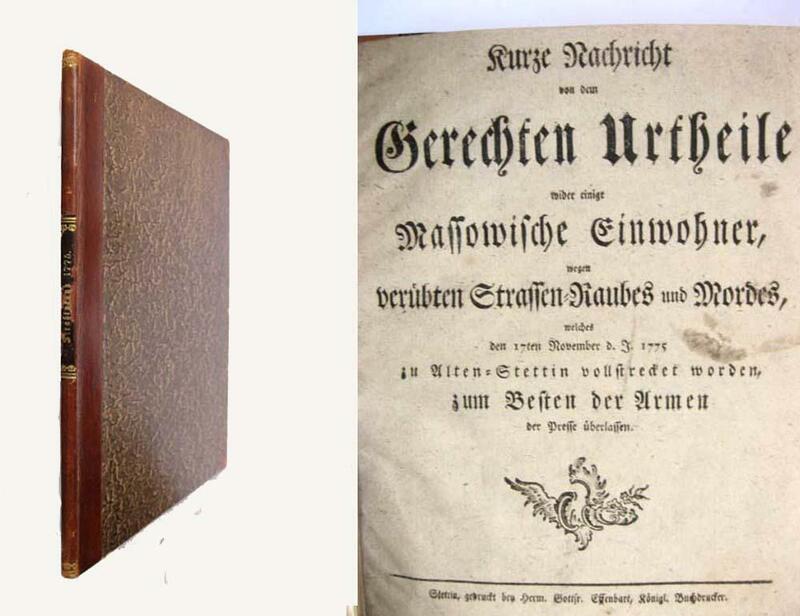 Einer unserer Berliner Buchhändler hat bey seinem vorigen Meßcatalogus einen Anhang von allen den Griechen u. Römern, die wir bereits, gut oder schlecht, seit vierzig Jahren besitzen. Hieraus werden Sie sehen, was uns noch fehlt. Des Apulejus milesisches Mährchen würde Ihnen ein leichtes Spielwerk seyn. Die Geschichte der Psyche (die das 3te bis 5te Buch ausmacht) finde ich in einer Wochenschrift, nehmlich in dem 2ten Theil des Zeitvertreibes für das schöne Geschlecht unter dem Titel Die belohnte Schönheit übersetzt. Vielleicht ist dieses nur eine Uebersetzung aus einer Uebersetzung. Wenn Sie sich lieber einen schweren Autor wählen wollen, wobey Sie Ihren schönen poetischen Ausdruck zeigen können: so ist es desto besser; und ich werde mich unendlich freuen, wenn ich durch meine Ermunterung Gelegenheit gegeben habe, daß Deutschland einen Alten mehr in seiner Sprache lesen kann. - Sie verlangen eine Handschrift von einer kleinen Ode, mein liebster Herr Baron? Hier haben Sie meine neusten alle, so wie ich sie zu einem zweyten Theil bestimmt hatte, ehe ich den Einfall bekam, sie unter die alten mit unter zu streuen. Fahren Sie fort mich zu lieben, und seyn Sie von meiner Gegenliebe und Hochachtung versichert [...]". - Einige Randeinrisse und etwas fleckig. ANECDOTES DES BEAUX-ARTS Contenant tout ce que la Peinture, la Sculpture, la Gravure, l'Architecture, la Musique, la Littérature, &c. & la vie des Artistes, offrent de plus curieux & de plus piquant, chez tous les Peuples du monde, depuis l'origine de ces différens Arts, jusqu'à nos jours. Représentation du feu terrible à Nouvelle York, la nuit du 19 septembre 1776 . XVIIIè - ESTAMPES Eau-forte rehaiussée. Importante vue d'optique. Réparation d'un angle .Rare témoignage de cet incendie qui ravagea la ville de New-York au tout début de la guerre d'indépendance. On peut voir de nombreuses maisons en flammes ainsi qu'une église (la Sainte-Trinité), des scènes de pillages et de tueries. Cadre en bois naturel. Il existe une copie inversée par Haberman, éditée à Augsburg vers 1718. An Inquiry into the Nature and Causes of the Wealth of Nations. 3 Bände (komplett). With a life of the author. 22,5 cm. lxxi, 360 vi, 512 vi, 448 S., Index. Ohldr. Kanten bestossen und beschabt. Rückengelenke etw. angeplatzt. Vorsätze schwach stockfleckig. Sehr vereinzelt etw. stock- bzw. braunfleckig und mit angerandetem Schnitt. Sonst keine Mängel. 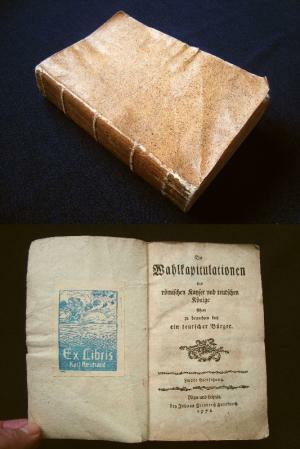 Die erste Ausgabe des bedeutenden ökonomischen Werkes, an dem Smith zehn Jahre lang schrieb, erschien 1776 in zwei Bänden. - In einem Aufsatz in dem Buch "Printing and the Mind of Man" (1967 deutscher Titel: Bücher die die Welt verändern, 1968 bei Prestel) heißt es dazu: "Die Geschichte der Nationalökonomie bis zum Ende des 19.Jahrhunderts besteht aus zwei Abschnitten: der merkantilistischen Phase, die weniger auf einer Doktrin beruht als auf einem System der Praxis, das sich aus den sozialen Verhältnissen ergab, und der zweiten Phase, welche die Lehre sich entwickeln sah, daß der Einzelmensch das Recht habe, in der Ausübung seiner wirtschaftlichen Tätigkeit nicht behindert zu werden. Man kann zwar nicht sagen, Smith habe diese Lehre erfunden - die Physiokraten hatten bereits darauf hingewiesen und Turgot im besonderen hatte eine durchgearbeitete Studie des gesellschaftlichen Wohlstandes entworfen -, doch ist sein Werk die erste wirkliche Ausführung dieser Theorie. Er beginnt mit dem Gedanken, daß die Arbeit die Quelle ist, aus der das Volk das bezieht, was es braucht. Die Verbesserung der Arbeitsteilung ist das Maß der Produktivität, und in ihr wurzelt der Hang des Menschen zum Tauschhandel: 'Arbeit ist das wirkliche Maß des Tauschwerts aller Waren ... sie ist ihr wirklicher Preis das Geld ist nur ihr nomineller Preis'. Die drei wesentlichen Elemente der Arbeit und so auch des Preises sind Lohn, Unternehmergewinn und Grundrente, und diese drei schaffen auch die Einkommen. Vom Wirken der Wirtschaft wendet sich Smith ihrem Ergebnis zu, dem 'Stock' oder Warenbestand, der alles umfaßt, was der Mensch entweder für seinen Eigengebrauch oder um des Ertrags willen besitzt, den es ihm bringt. 'Der Wohlstand der Nationen' schließt mit einer Geschichte der Wirtschaftsentwickklung, einem scharfen Angriff auf das Merkantilsystem und einigen prophetischen Überlegungen über die Grenzen der Wirtschaftskontrolle. Während die Erforschung der politischen Aspekte der Menschenrechte zwei Jahrhunderte in Anspruch genommen hatte, bestand Smiths Leistung darin, daß er die Untersuchung der wirtschaftlichen Aspekte in einem einzigen Werk bis zum gleichen Punkte vortrieb. Sein 'Wohlstand der Nationen' stellt kein System dar, aber als vorläufige Analyse ist das Werk völlig überzeugend. Die Sicherheit seiner Kritik und sein Verständnis der menschlichen Natur haben es zum ersten und zum bedeutendsten unter den klassischen Werken der modernen Volkswirtschaftslehre gemacht." - Als Beilage dazu: Horst Claus Recktenwald: Adam Smith - Sein Leben und sein Werk. München: C.H. Beck, 1976. 1. Aufl. XIV, 311 S. Oln. - OS. Sehr guter Zustand. Mit halbseitiger Widmung des Autors. = Zum 200. Geburtstag des Klassikers 'Der Wohlstand der Nationen'. Die geistige Grundlage der modernen Marktwirtschaft 1776-1976. Der Rheingauer Weinbau, aus selbst eigener Erfahrung nach der Naturlehre systematisch beschrieben, nebst Anhang: über Weinbehandlung, Gebrechen der Weine und deren Verbesserung. 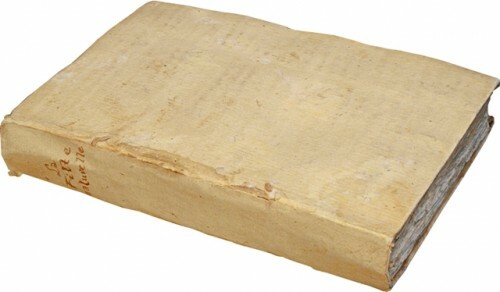 XII, 187 S., 2 Bl. 8 (18,8 x 11,6 cm). Marmorierte Broschur der Zeit. Einzige Ausgabe. - Das zweite Werk Hecklers zum Rheingauer Weinbau, "worin in leicht faßlicher Sprache jede in den Weinbergen vorkommende Arbeit, nach Zeit und Umständen wohl erwogen, abgehandelt wird und überdies das Nothwendigste und Wissenswürdigste über Traubenlehre, Weinbereitung und Weinbehandlung ausführlich zur Sprache kommt" (Vorwort). - Heckler (1776-1860) war Apotheker, Bürgermeister von Eltville und langjähriger Oberkellermeister (1827-49) von Schloß Johannisberg. Berühmt ist seine Durchsetzung der gestaffelten Lese im Jahr 1822 bei der Nassauischen Landesregierung (vgl. Staab, Beiträge zur Geschichte des Rheingauer Weinbaus, S. 29). Johann Philipp Bronner galt er als "einer der ersten Oenologen Teutschlands". - Unbeschnitten und teils unaufgeschnitten. Wie üblich papierbedingt gebräunt und stockfleckig, stellenweise seitlich gering wasserrandig, anfangs einige Knickspuren. *Schoene3 6739. Claus, Persönlichkeiten der Weinliteratur (2. Auflage), 68. Dochnahl 67. Simon, Bibliotheca Vinaria, 125. Wagenmann, Bibliotheca oenologica, 22. Nuove scoperte fatte nel 1765. 67. e 69 nel Mare del Sud. 1776. Incisione in rame, colorata d'epoca. Mm 417x337.Decorativa carta del pacifico meridionale raffigurante Nuova Zelanda, Australia orientale, Nuova Guinea e Polinesia fino alle isole Salomone. Mostra le rotte di Carteret, Wallis, Byron e Cook.Antonio Zatta (1775-1797) fu uno dei più importanti editori di carte geografiche del tardo XVIII secolo italiano. La sua opera costituisce un importante punto di passaggio tra la cartografia antica e moderna, più attenta all'accuratezza dei dettagli geografici che all'abbellimento estetico ricco di motivi mitologici o d'invenzione, come era quello dell'epoca precedente. La sua opera più importante è Atlante novissimo pubblicato tra il 1775 e il 1789. Ottimo esemplare con ampi margini. Tooley, Australia, p.176, 1431. Copper engraving, original colour. Mm 417x337Decorative map of the southern Pacific, showing east Australia, New Zealand, New Guinea, Polynesia and the Society Islands, showing the tracks of Carteret, Wallis, Byron and Cook's route along the east coast of Australia, and round New Zealand. Antonio Zatta is among the most important italian map editors of the late XVIII century. His most important work is Atlante novissimo published between 1775 and 1789. Very good condition. Tooley, Australia, p.176, 1431. Anonym erschienen. Unpag.+ 400 resp. XII + 292 S., zeitgenössische gesprenkelte Interimsbroschur, Deckel wellig + an den Ecken aufgebogen, Rücken mit Titelbeschriftung, Papier wellig + minimal gebräunt, Schnitt gebräunt, ExLibris "Karl Reichard" im Innendeckel.